Le Trec, for anyone that doesn’t know, is probably the most fun you can have on a horse. Originally a French discipline developed as a test for tour guides, it involves three sections. It’s becoming increasingly popular in the UK, and the BHS run regular competitions nationwide. You can also complete at Kelly Marks’ Winter Series, which includes the PTV and COP sections only. Much of the terminology in the sport is French. “POR” stands for Parcours d’Orientation et de Régularité, which roughly translates as ‘Test of Orienteering and Regular Paces’. This section involves orienteering over a set route at a set pace, navigating by an OS map and compass. This is designed to test accuracy and map-reading ability. Several stewards are positioned around the course to check that competitors maintain a regular speed between checkpoints. The PTV, or Parcours en Terrain Varié (test over varied ground) section involves navigating a series of obstacles, designed to simulate natural hazards that you might find out hacking, such as ditches and low-hanging branches. Blue and I join a dozen other riders at Pam Rigby’s fantastic Chelford venue, New Barn Livery, for a tryout session with coaches Phil Weaver and Cath Cromarty from Mercia Trec. We’re split into smaller groups for safety, and I’m put into a group with five others. We have a varied bunch of horses: two hairy cobs, one warmblood dressage horse, an Andalucian, a Welsh cob and my TB/Welsh mare. The beauty of Trec is that any horse can take part, as the competition is so varied that every horse will shine at some part of it. Julia McHugh demonstrates the lead corridor with Cathy London's horse Tuesday. Due to space contraints at our venue, this stage is discussed as theory only. Phil provides us with a photocopied section of an OS map. In a Stage 1 (beginners) competition, we’d have 10 minutes to copy the route onto our own maps before setting off. Phil points out some of the ‘tricks’ that organisers can use to test competitors – having to leave the road to ride on a specific side of the hedge, for example. The corridor is marked round the outside of the arena with plastic markers, with timing equipment set at both ends. Penalty points are awarded for leaving the corridor or breaking pace. Our group set off one by one with varying degrees of success – some horses don’t like going through the timing gates, and several change pace more than once along the corridor. Blue’s slow canter is not her strong point, but at least there’s no danger of her dropping down into trot and we don’t collect any penalties. Once through the gates at the other end, we return to the start of the corridor and walk back along it, aiming for a fast walk. Phil advises, “Try for a free walk on a long rein. The judge is looking for a relaxed, long-striding horse, not one that’s constantly nagging to break into trot.” Blue swings along happily on a long rein and collects a decent score. We all have several tries at the exercise until each horse can navigate the corridor without jumping or spooking at the plastic markers. Every competition includes up to 16 obstacles, which may be spread in the middle of a field. The obstacles are chosen from a master list and will vary slightly from venue to venue, as organisers make use of natural features such as hedges and ditches. Our indoor session consisted of a corridor, an S-bend, low-hanging branches, bending poles, a ditch to jump, a bridge and mounting and immobility exercises. Fresh off the trailer, Blue is not happy about starting with the corridor, an exercise that requires precision. 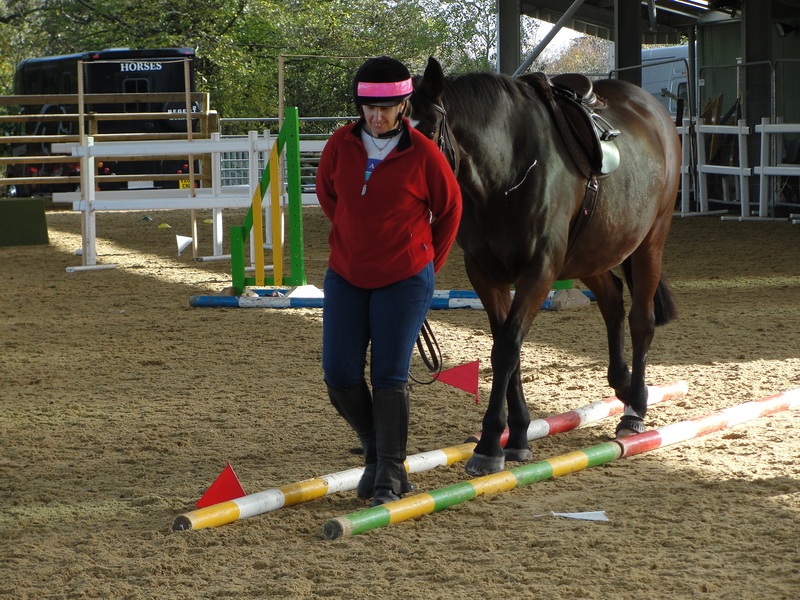 Two jump poles are laid a few inches apart, and the horse is required to walk, trot or canter between them without touching a pole. Needing to let off some steam, Blue tries to jump the poles lengthways before clattering down them sideways. 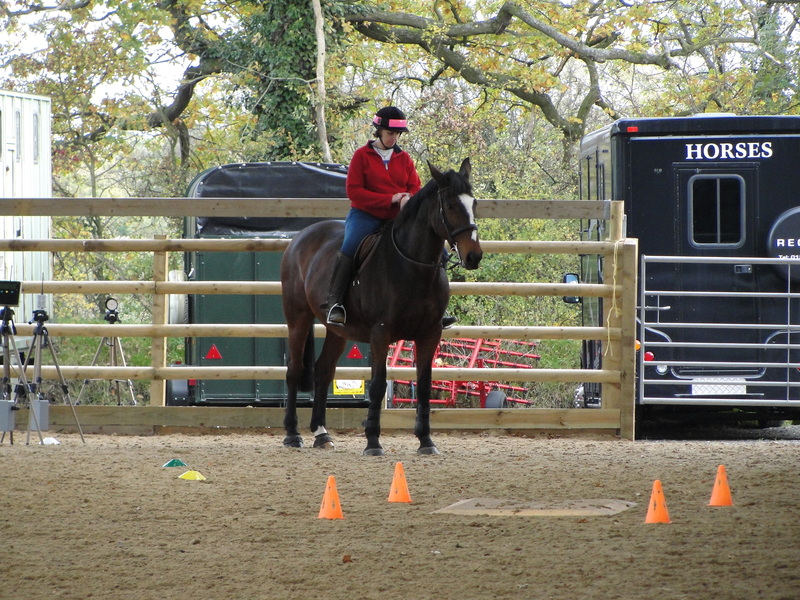 I take her to the far end of the school to trot some series circles whilst Phil coaches the rest of the group. The S-bend is made from jump poles on the ground and involves two tight turns on the forehand. “Ride your horse right into the first section until its forefeet are up against the pole, otherwise you won’t have room to get round,’ advises Phil. Here the smaller horses have an advantage, but we all manage a respectable attempt, although Blue is still feeling cross and jumpy. I take her off for a canter. The low-hanging branches are next, a structure made from two sets of poles with light bamboo canes laid across the top. In a competition, the poles would only be a few inches about the height of the horse’s withers, so Phil coaches us to lie along our horses’ necks and off over one shoulder so that we don’t knock the poles down ourselves. All the horses are happy to walk under the structure the first time, but one or two get worried as poles are knocked down. Blue has settled now, and walks and trots under happily. Phil removes the first bar for the nervous horses, and soon has all of us walking under calmly. Next to the immobility exercise. We all dismount, and one by one put our horses into the marked out ring. We secure our reins and leave the horses standing whilst we retreat to the outer edge of the circle. The horses need to stay inside the circle by themselves for a count of 10 to pick up maximum points. All the horses are tiring now, and the whole group manages this with no problem.